The District Department of Transportation says the intersection of 14th and Irving streets Northwest will soon be the site of what's called a “Barnes dance” crossing. WASHINGTON — A busy intersection in Northwest D.C. is going to see some changes over the next few weeks. 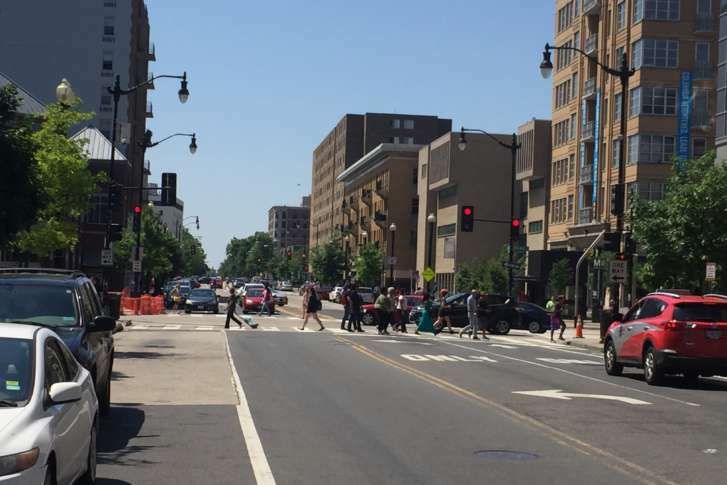 That intersection in Columbia Heights, right next to the Metro station, sees thousands of cars and even more pedestrians every day. The concept, named after the late traffic engineer Henry Barnes, was widely used decades ago and is making a comeback in pedestrian-heavy areas around the world. It gives pedestrians a chance to cross the intersection in all directions, even diagonally, by stopping vehicle traffic with red lights all around. Pedestrians also get more time to cross the intersection, where right turns on red are prohibited. The flip side is that pedestrians also have to wait longer on street corners before they get a “walk” signal. Construction to improve pedestrian and handicap access to the new signals is expected to begin soon, and shouldn’t take more than a couple of weeks. DDOT says everything should be activated by the middle of the month. D.C. already has one “Barnes dance” intersection. For several years now the intersection of 7th and H Streets Northwest in Chinatown have also featured pedestrian crossings in all directions, with vehicles prohibited from making any turns.